I'm translating man pages, and have run in to a few problems with Emacs. To view a work in project, I use for example M-x man RET ./ls.1 (that is, the absolute path). 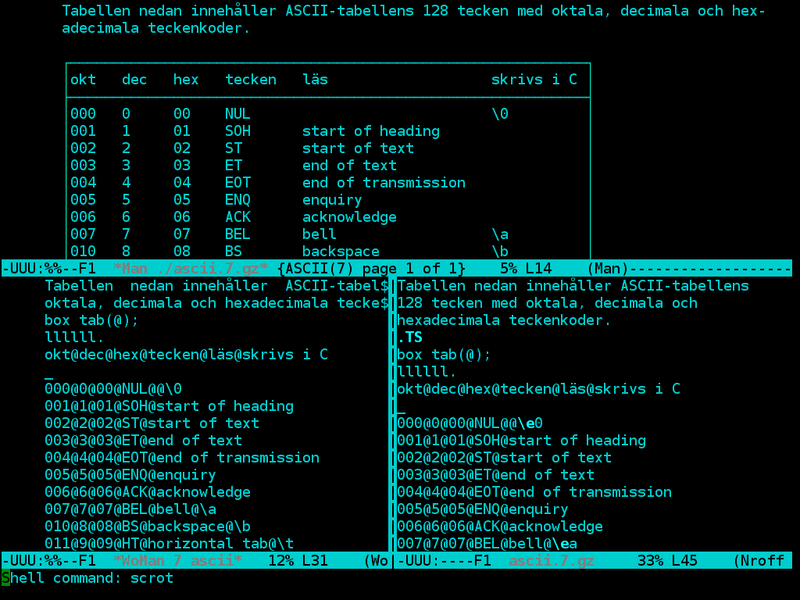 This is great, because it is the same man mode as for viewing "real" manpages (those in /usr/share/man). Only, when I do some changes in the document, how do I refresh the manpage? revert-buffer says the buffer is not associated with a file (not true, but OK, I get it); M-x load-file RET seems to have lost track of the file; ... Ideas? By the way, translating is a lot of fun! "edit the current work-in-progress man page"
"update the current work-in-progress man page"
This version of upman is hopefully more stable. Note the introducton of a new global. Not the answer you're looking for? Browse other questions tagged emacs man roff or ask your own question. How to follow links in linux man pages? How to send the content of an emacs buffer to gcc without writing to disk? Why isn't Gnus scoring emails based on the To: or Cc: headers?